My husband and I are big fans of lighthouses and we try to see as many as possible when we are traveling. 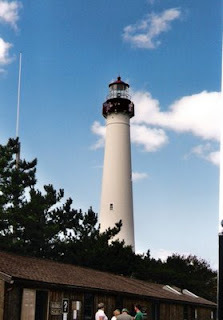 One of our favorite lighthouses is the Cape May Lighthouse in Cape May, New Jersey. The lighthouse sits on beautifully landscaped grounds with a gift shop and a small educational center which is free. However, if you want to climb all 212 steps to the lookout point, you will have to pay the admission price to enter the lighthouse itself. The view from the top of the lighthouse is incredible! You can see for miles upon miles. On the property you'll find two accesses to the beach. You can go on the beach and enjoy it for FREE here with no beach tags required. In addition, there are public restrooms that you can use, a few picnic pavilions and some walking trails that you can enjoy. It's a beautiful park and beach area that is 100% family-friendly. If you're going to spend the afternoon or day here...pack a lunch and a cooler full of beverages, because there are no eateries located on the property or in the park. Nearby you'll find Sunset Beach which is one of the prettiest beaches in Cape May...plus you can sit and go on the beach for free (no beach tags required). Sunset Beach also has 3 gift shops and a little cafe/grill where you can grab a bite to eat. Parking at Sunset Beach is FREE! If you're looking for the famous Cape May diamonds...this is the place you want to be! If you plan on visiting the Southern New Jersey Coast or you are a lighthouse fan, this one is a must see and it's one of my absolute favorite lighthouses in the state of New Jersey. We visited this lighthouse a few summers ago before we had the triplets. I'd love to go back there for family vacations every year when the boys are older.